Ahmadinejad with Iraqi President Jalal Talibani from al-Jazeera. Al-Hayat reports that Iranian President Mahmoud Ahmadinejad will visit the Shi’i holy cities of Najaf and Karbala to visit the shrines of Imams Ali and Husayn, respectively, and pay a visit to Grand Ayatullah Sistani. A representative from Sistani’s office has confirmed the visit, but did not give details on what would be discussed. Iraqi security forces have taken increased security measures in preparation for his visit and the Electric Ministry announced that electricity will not be cut from Imam Ali’s shrine in Najaf for the next three days. Shaykh Husayn al-Safar, a top religious scholar in the Najaf hawza (or seminary), said that Ahmadinejad’s visit is confirmation that the hawza of Najaf is the principle center for Shi’i studies and that the city’s ‘ulama (or religious scholars) are recognized as spiritual leaders of the Shi’a. Another scholar said that despite Sistani’s Iranian identity, Sistani operates outside of the framework of nationalism and politics and that he has not recognized the authority of the walayat al-faqih. The three other grand ayatullahs living in Najaf — Muhammad Sa’id al-Hakim, Muhammad Ishaq al-Fiyad, and Bashir al-Najafi — also do not recognize the concept of walayat al-faqih and refuse to have it taught in the hawza. In the summer of 2007, Ahmadinejad paid a visit to Shi’i shrines in Damascus, including the shrines of Sayyida Ruqayya and Sayyida Zaynab. (Ruqayya is the daughter of Imam Husayn and Zaynab his sister.) The big news at this time was that Ahmadinejad broke into tears at Zaynab’s shrine. Maybe we’ll have a repeat showing. Some nice photos of the Imam Husayn shrine in Karbala from this site. 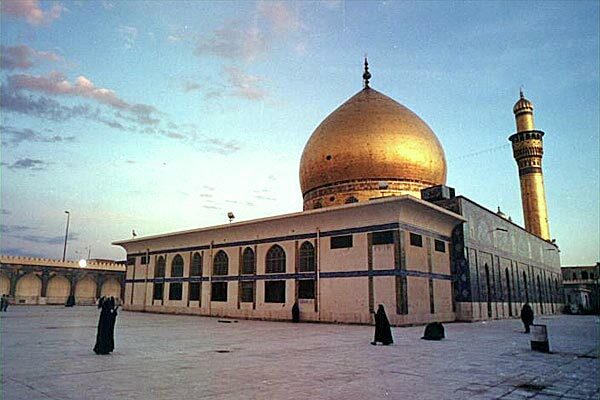 In February 2006, two bombs were detonated inside the Askariyya Shrine in Samarra, destroying its gold dome. In 2007, several more explosions destroyed the shrine’s two minarets. Reconstruction has now begun on the mosque, which is the final resting place of the 10th and 11th Imams — al-Hadi and al-Askari. Here is a RealPlayer video of the aftermath of the Askariyya bombings. Al-Manar reports that the reconstruction will take place in two phases. The first will involve clearing the rubble and collecting salvageable pieces of the gold dome. In the second stage, a Turkish company, specializing in reconstruction will restore the building’s shape under the supervision of UNESCO. The cost is estimated at $50 million dollars. You are currently browsing the Shrines category at the news in arabic.